Capitalism, populism and democratic openness characterized the American tarot scene from its beginnings in the early 20th century. If you wanted to learn about Tarot, you didn’t have to be proposed for membership in a secret lodge. By 1920, you could attend one of Paul Foster Case’s public lectures or purchase his correspondence course. C. C. Zain’s Brotherhood of the Light also offered mail order lessons. Do-it-yourselfers could buy a pirated Rider Waite deck from the de Laurence publishing company and teach themselves how to read with their pirated edition of Waite’s Pictorial Key to the Tarot. In 1917, F. Homer and Harriette Curtiss, followers of Madame Blavatsky, illustrated the first American tarot book, The Key to the Universe, with the Wirth, Falconnier-Wegener, Tarot de Marseille, and Rider Waite Smith decks. Let’s look at each tradition as it adapted to the North American environment. The first Tarot style to gain a foothold in North America was the Egyptian deck designed by French occultists Falconnier and Wegener in 1890 based on the esoteric writings of Paul Christian. In 1918, C.C. Zain (Elbert Benjamine 1882-1951) used Wegener’s Egyptian deck for his Brotherhood of Light mail order lessons. This was the first time Paul Christian’s teachings were available in English. 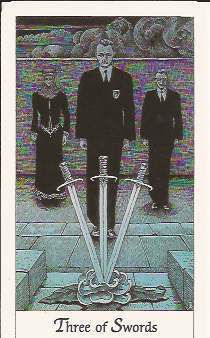 In 1936 the deck was redrawn by Gloria Beresford with no significant changes to the design, then redrawn once again in 1994 and issued as The Sacred Tarot. Now called the Church of Light, the organization still offers Zain’s correspondence courses. It seems that every generation appropriates the Egyptian deck for its own use. In 1930 John Dequer used the Falconnier-Wegener deck to illustrate his book Arrows of Light from the Egyptian Tarot. In 1951 Dequer’s student George Fathman used the deck to illustrate his book The Royal Road. In 1967 Doris Doane, a graduate of Zain’s esoteric school, used the same deck to illustrate her book How to Read Tarot Cards. 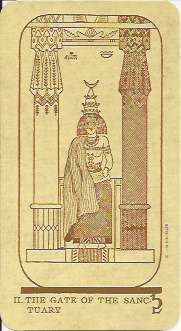 In 1973, Lynn Buess used a re-drawn Egyptian deck for his book The Tarot and Transformation. 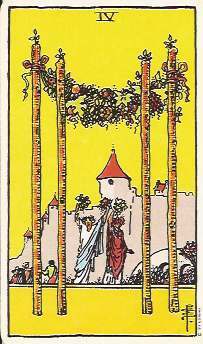 Wirth, one of the giants of French Tarot, has always had a following in the English-speaking world. 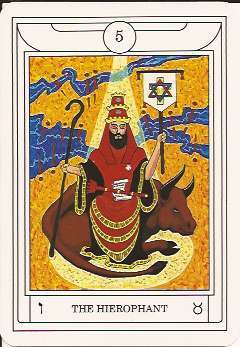 In 1887, he designed a tarot deck according to Eliphas Levi’s specifications – a Tarot de Marseille with cabalistic and Egyptian flourishes and Hebrew letters printed on the cards. 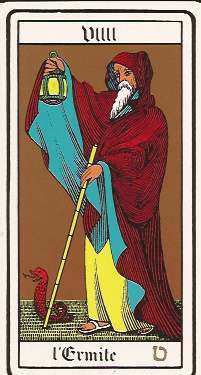 Wirth’s teachings on how to read Tarot were translated into English and published in the United States in the 1980s as Introduction to the Study of the Tarot. Two other books written in Europe and translated into English were illustrated with Wirth’s deck: The Wisdom of the Tarot by Elizabeth Haich and the Tarot of the Bohemians by Papus. In the 1920’s, Augustus Knapp began his collaboration with Manly P. Hall, founder of the Philosophical Research Society, that resulted in the Knapp-Hall deck published in 1978. This deck is a blend of Wegener’s Egyptian designs and Oswald Wirth’s deck. The TdM was the last style to catch on in North America and has had the least influence. In fact, the Rider Waite Smith deck has so dominated North American Tarot that many American tarot students don’t know the TdM exists. Rolla Nordic, a British witch and student of Frank Lind’s Insight Institute, moved to New York in the early 1960s and produced the first updated TdM. Her black and white deck drawn by Paul Mathison has a folk-art feel and was meant to be colored by her students. Her 1960 book Tarot Shows the Path gives her card meanings and reading techniques. Some of her students published books illustrated with her deck: Carlyle Pushong’s Tarot of the Magi, Sandor Konraad’s Numerology with Tarot, and Richard Gardner’s Evolution through the Tarot. As Americans became aware of Tarot’s history, they became curious about the possibility of reading with historic decks and created a market for reproductions of historic French and Italian decks. Artists like Kris Hadar, and Rodes & Sanchez have followed Nordic’s example and redesigned the TdM to give it a more modern and fresh appearance. Publishers like Fournier, Cartes France and France Jeux have created decks with a contemporary feel and brighter colors. Although Aleister Crowley was British, his deck has a strong American connection. Crowley spent WWI touring the U.S. and Canada, networking and acquiring disciples. In 1914 a follower known as Frater Achad founded the first O.T.O (Ordo Templi Orientis) in Vancouver, B.C. and wrote extensively on Crowley’s teachings. The Thoth deck was not available to the public until 1969, when G. L. McMurtry, the American head of the O.T.O. photographed a deck and published a poor quality version. Later versions of the deck published by U.S. Games and Weiser are printed from photos of the original oil paintings. The Thoth deck’s influence can be seen in many contemporary decks: Cosmic Tribe by Stevie Postman, Rohrig, Voyager by James Wanless, Cosmic Tarot by Norbert Losche, and Tarot of the Spirit by Pamela Eakins. The Golden Dawn established a beachhead in the U.S. early in the 20th century with temples in New York City and a few other major cities. Israel Regardie (1907-1985), who had been Crowley’s secretary in the late ’20s and a member of Dion Fortune’s Stella Matutina, a spinoff of the Golden Dawn, emigrated to the U.S. in 1937, where he published all the Golden Dawn’s rituals and tarot lore. Regardie then became a Reichian therapist and disappeared from the occult scene until the 1970s when he returned to help revive the O.T.O. by founding temples in Georgia and Los Angeles. In the 1970s and 1980s, Regardie collaborated with various members of the O.T.O to create The Golden Dawn Tarot (Robert Wang), The Golden Dawn Magical Tarot (Chic and Sandra Cicero) and the New Golden Dawn Ritual Tarot (the Los Angeles O.T.O. temple). Paul Foster Case and the B.O.T.A. After leaving the New York branch of the Golden Dawn, Paul Foster Case dedicated his life to making Tarot accessible to all by giving public lectures, selling correspondence courses, and writing numerous articles, pamphlets and books on Tarot. In the 1920’s he founded the Builders of the Adytum (B.O.T.A.) whose teachings are very similar to the Golden Dawn’s. In 1931, Case commissioned a deck for the B.O.T.A. from commercial illustrator Jesse Burnes Parke that turned out to be very similar to the Rider Waite Smith deck, much to Case’s disappointment. His career culminated in 1947 with his book The Tarot, a very readable and jargon-free distillation of his teachings. The B.O.T.A. is still active and offers rigorous esoteric training by correspondence course. In 1918, the American publisher deLaurence began pirating the Waite Smith deck and A. E. Waite’s book The Pictorial Key to the Tarot. 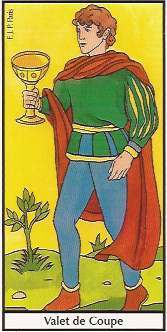 They quickly became the most popular tarot publications in the English-speaking world. In 1959, the book and deck became even more ubiquitous when they were picked up by a major publisher, University Press. In the ’60s and ’70s, Eden Gray’s blockbuster tarot books, which are still in print, disseminated Waite’s deck and card meanings even further. By the mid 20th century the Waite Smith deck had become the standard American deck and the touchstone for future developments in deck design. 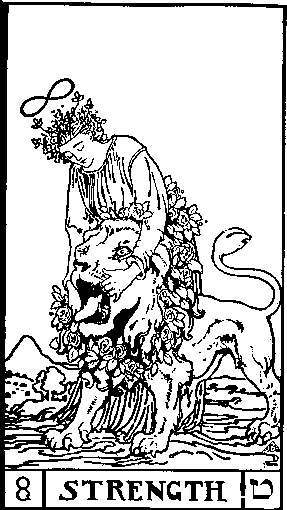 The American tarot scene was rather dormant from the 1930s through the 1950s. Macy’s department store carried a tarot deck, presumably a Rider Waite Smith, in the mid-1950s, so there must have been a market for Tarot among the general population. Until the late 1950s, the selection of books was very narrow and nearly all rooted in 19th century esoteric traditions. This stagnant scene blew wide open in the 1960s as Tarot detached from esotericism and became accessible to a wider audience. On the next page we’ll see how Tarot became a fixture in American popular culture.